← War Does Not Determine Who Is Right – Only Who Is Left. You ought to be sorry when bad things happen, right? In 8 years of marriage my husband has never uttered the words I’m sorry. You might find this odd however, after speaking with other women I realize that my husband is not the only man who does this. The challenge in our relationship comes in our philosophical and cultural difference about the two words “I’m sorry”. Me: I believe that you should accept responsibility for your actions and try to make it right by taking a first step and apologizing. Him: Sorry doesn’t fix anything. The action has already been committed so sorry will not help. As you can imagine, this becomes problematic when raising our children. At 35 years of age I reflect daily on my Life and there are SO many things I wish I could apologize for; had I known better. So of course, as a mother I believe it is my duty to teach my children how to apologize But, our ongoing battle and discussions have made me dig a little deeper into just what apologizing means to him and if maybe, MAYBE, he might have a point. But I beg to differ. In fact, as the world becomes a global village, apologies are growing increasingly important on both national and international levels. Communications, the media, and travel have drawn the world ever closer together. Ultimately we all share the same air, oceans, and world economy. We are all upwind, downstream, over the mountains, or through the woods from one another. We can’t help but be concerned with Russia’s failing economy, Eastern Block toxic waste, Middle Eastern conflicts, and the rain forest, whether it be for reasons of peace, fuel, or just plain oxygen. In this international community, apologies will be vital to peaceful resolution of conflicts. Within the last several years alone Nelson Mandela apologized for atrocities committed by the African National Congress in fighting against apartheid; Exxon for the Valdez spill; Pope John Paul II “for abuses committed by Christian colonizers against Indian peoples”; former Japanese Prime Minister Morihiro Hosokawa for Japanese aggression during World War II; and Russian President Boris Yeltsin apologized for the massacre of 15,000 Polish army officers by Soviet forces during World War II. And that’s only the start of it. Probably no language function has been in the news more lately than the function of apologizing. Week after week, the famous as well as the infamous stand before the public and apologize or, in any case, receive demands for apologies. Hardly a week goes by without some apology or other making the news – often the front pages. It seems like it should be such a simple thing, teaching your child or student to say “I’m sorry” when an apology is called for. But far beyond simply repeating a conditioned response, truly understanding the nature of an apology and being able to deliver one sincerely requires a level of social competence that many adults find difficult. As parents we want to teach our children empathy for others. It’s part of teaching them that they have an impact on their world and the people around them. Teaching our kids to say “sorry” encompasses all sorts of good things, like making friends and sharing, so it makes sense that “sorry” is one of our first verbal lessons. In some ways we intend this word as a hinge, linking the behavior of one child to the feelings of another, and it makes sense to put it this way because we want those connections to be made in our children’s minds. 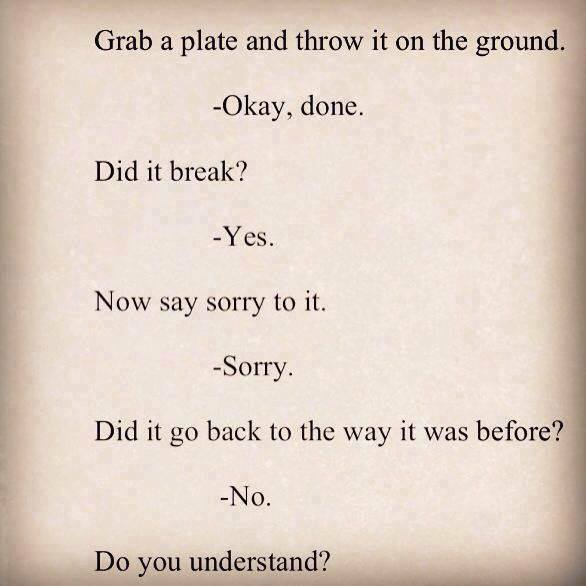 However, “sorry,” as a word, often turns up empty, while hurt feelings (or body parts) persist. This is why it becomes important to emphasize to children that the word isn’t just a word, it is also an action. We, as parents, need to watch for the “sorry” that becomes nothing more than a behavioral escape hatch, leaving the conflict largely unresolved. Some argue that a full apology requires many more elements than just those two words, such as acceptance of responsibility, an expression of genuine remorse, an offer to make amends, and an excuse-free explanation. After a fight and before forgiveness often comes an apology. But saying “I’m sorry” comes more easily for some people than it does for others. There is even a new study that suggests that specific personality traits offer clues about whether a person is likely to offer a mea culpa. To me, the biggest stumbling block to apologizing is our belief that apologizing is a sign of weakness and an admission of guilt. We have the misguided notion we are better off ignoring or denying our offenses and hope that no one notices. On the other hand, sometimes apologies come too easily and too frequently, as when we apologize for things that are clearly not our fault, not in our control, or otherwise unworthy of apology. Examples include apologizing for being hurt by someone else’s offense, apologizing for being over-sensitive, apologizing when someone else bumps into you, and apologizing for apologizing. It seems “I’m sorry” is infamous for its inadequacy. It often seems flippant, insincere, or incomplete, as in “I’m sorry you feel that way” or “I’m sorry, but…”. Wayward public figures are notorious for inadequate apologies, especially those that involve a failure to own up to wrongdoing. Academic research has found that accusations of wrongdoing are often made in hindsight based on what psychologists call the “curse of knowledge.” The curse of knowledge exists when the outcomes of a decision are used to evaluate the quality of a decision in hindsight. In other words, once the outcome is known for a decision made under conditions of uncertainty, everyone knows whether the decision was good or bad. The old saying, “hindsight is 20/20” relates to this phenomenon. So will two words fix it? Sadly, it’s a common mistake. We as parents and caregivers often fall into the trap of looking for a formula that saves us from having to think all the time. We’re busy. We’re stressed. Analyzing every single conflict situation that comes up with our children is sometimes difficult, sometimes downright impossible, given the other demands on our time and the frequency of the conflicts. We’re hanging out for a short cut, a magic solution. Siblings or peers fighting? Someone must be at fault. Therefore someone needs to apologize. If we can work out who’s to blame and make that sorry happen, it’s all sorted. Sorry, as a word, means very little to kids. It’s a thing that’s required, like “please” and “thank you,” but kids say it largely to appease adults, and the word has very little in the way of meaning or impact. It’s a word without identity; you can’t point to “sorry,” and it’s not a cat or a sandwich or a ball at the beach. Even as a feeling it is hard to identify. It’s not happy or sad or hungry or tired, it’s just a thing you say when you’ve done something wrong. If you accidentally spill some cereal on the table or leave the car door open, you have to say you’re sorry. If you eat your sister’s cookie, you’re sorry. And, if you pick up a Lincoln Log and hit your brother over the head with it because at that moment you absolutely, positively hate him, still, you’re sorry. So what does it really mean? What is its purpose? I’ve been told sorry doesn’t fix the hurt. It doesn’t take away the pain; doesn’t mend the broken pieces like super glue is supposed to it just smooths it over and brushes away the shards and sticks an ugly band-aid on top and expects everything to be ok.
I’m sorry doesn’t mean anything anymore to anyone it just something you say to make the other feel like you really are but you’re not and if you are it doesn’t matter because sometimes the wound just goes too deep stitches couldn’t even repair the damage. Even if there was a doctor who worked on hearts like a mechanic works on an engine there’s no way to fix a broken metaphorical heart it has no real shape no real place of being. That’s because words are not magical. Words are not erasers; they cannot make bad actions go away. Only good actions can start to make bad actions feel okay. We all know adults who constantly apologize for their bad behavior, then tomorrow or next week do exactly the same thing again. Where do you think that starts? So, I’ve come to learn that the real point of an apology is forgiveness. And, forgiveness should never be based on the apology. In fact, if you think about it there really are few instances when the one who has been hurt will be fully satisfied by the apologetic response. The hurt remains and the insult apparent. To our little girl, she fully expects retribution for anything her brother has done to her. Raising little boys who fight it out on the “battlefield”, girls are a bit more of a challenge as they seek a “courtroom” so to speak. They are looking for judgment and enforcement of the verdict. However, God has told us to forgive. In fact, God goes so far as to say that if we choose to be unforgiving then we cannot experience God’s forgiveness. What we seek from God is fully contingent on how we choose to treat others. With that in mind, forgiveness is absolutely imperative for those who seek a relationship with God. It can be difficult to admit being wrong (we are well-equipped with psychological defenses and self-serving biases to protect us from facing the possibility that we messed up), and it can be scary to make oneself vulnerable to the possibility of rejection, since an apology, no matter how heartfelt, does not always elicit forgiveness. That is why a genuine apology offered and accepted is one of the most profound interactions of civilized people. It has the power to restore damaged relationships, be they on a small-scale, between two people, such as intimates, or on a grand scale, between groups of people, even nations. If done correctly an apology can heal humiliation and generate forgiveness. Yet, even though it’s such a powerful social skill, we give precious little thought to teaching our children how to apologize. Most of us never learned very well ourselves. We tend to view apologies as a sign of weak character. But in fact, they require great strength. And we better learn how to get them right, because it’s increasingly hard to live in the global village without them. This entry was posted in motherhood, Spirituality and tagged African National Congress, apologyletter.org, Boris Yeltsin, Bruce Willis, Elton John, History, Marcus Prouse, Morihiro Hosokawa, Nelson Mandela, Sorry seems to be the hardest word, Twentieth Century, World War II. Bookmark the permalink.